There are certain beers that you just know are going to be delicious judging by the name, description, or label. Narragansett Allie’s Double Chocolate Porter is not, however, one of those beers. Despite the marketing to make it seems like a chocolate bomb, it’s actually a poorly-brewed porter that does not deliver as promised. I poured a 16oz can into a tulip glass. It was canned on 9/2/15 and cost $2.39 ($0.15 per ounce). Appearance: Black in color, but not inky opaque. Pours to a surprisingly small, tan, soapy head which fizzles away quickly and completely. Smell: The first thing I notice is a slight vinegar scent, though there’s also some chocolate syrup or other candy-like aroma. The latter component, while nice, is completely overshadowed by the former. It’s not a good-smelling beer. Taste: Reading over the reviews of this beer, it sounds as though there’s an either a contaminated batch of it going around, or perhaps this beer just does not age well at all. This can is less than four months old, but it seems to have lost all its genuine flavor already. There’s a sharp tang right away; a flavor not too far removed from vinegar. I do notice some chocolate-like flavor lurking in the background, but not to the extent that I would consider this a chocolate beer. It has a slight cola taste as well, though that’s not necessarily an attribute. Otherwise, there’s really no genuine porter character to found. Either this was very poorly brewed, or the brewers’ definition of chocolate differs greatly from mine. 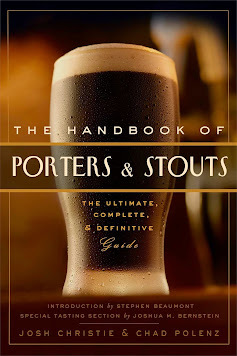 Drinkability: Porters aren’t as thick as stouts, but they shouldn’t be paper thin, either. Narragansett Allie’s Double Chocolate Porter is much too light for the style. Though only 5.5% ABV, it has the mouthfeel of a stale lager. Slightly fizzy; noticeable thin, with a watery texture and (thankfully) completely clean aftertaste.